Product Description: From SunTheanine, a 100% pure, patented source of L-Theanine manufactured in Japan by Taiyo International. 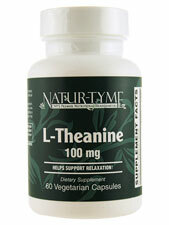 SunTheanine has been extensively evaluated in many scientific studies and shown to support relaxation and deep, restful sleep without causing drowsiness or other unwanted side effects. Additional Info: Store in a cool, dry place and away from direct light. Suggested Use: As a dietary supplement, adults take one (1) vegetarian capsule, one (1) to three (3) times daily, or as directed by a healthcare professional.